The United States is a very attractive destination for immigrants seeking a better life. To come to the United States, immigrants need a Green Card or Permanent Resident Card, which proves they have lawful permanent resident status and are entitled to live and work permanently in the United States. They can apply for a visa and a Green Card while abroad. Prepare all your supporting documents to support your Green Card application. If you are married to a U.S. citizen, your marriage certificate is one of the documents you must submit. Other ways people qualify for a permanent resident card include adoption, employment, investment, a diversity lottery or a relative. In each case documents are required to back the application. These may include passports, birth certificates, bank statements or other documents. The application form will list the documents required in order to complete your application. Present your application to the U.S. Embassy or consulate in the country where you live. In many countries, you will also have to deal with the National Visa Center. The NVC will communicate with you and your petitioner, if you are being sponsored. Your application will then be transferred to the U.S. Embassy or consulate in the country of your residency. Wait for the embassy or consulate to schedule an interview with you. Be prepared to answer all questions clearly when you attend your interview. Carry all important documents to your interview, such as your passport, police certificates, birth certificate and, if appropriate, marriage certificate. Other original documents might be required, depending on the category under which you are applying for permanent resident status. Even Diversity Lottery winners have to go through the same procedure. Submit the documents upon arrival at the embassy. Officials there will review your documents to make sure everything is in order before interviewing you. When officials are satisfied with your application, they will grant you a visa and stamp your passport, allowing you to travel to the United States. You will only obtain a Green Card after you arrive in the United States. It takes a minimum of three months for U.S. Citizenship and Immigration Services to send you a Permanent Resident Card. U.S. Immigration Support: "Green Card Application"
Nolo: "How to File a Green Card Application"
U.S. Citizen and Immigration Services; "Forms"
Manda, Gilbert. "How to Apply for a Green Card While Living Abroad." 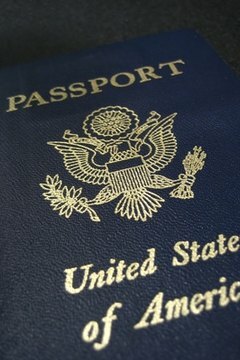 , https://legalbeagle.com/6225870-apply-green-card-living-abroad.html. Accessed 21 April 2019.